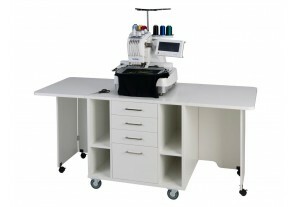 This versatile table cabinet has been especially designed with the professional home and commercial embroiderer in mind. Made to exacting technical specifications to cater for heavy duty embroidery machines it combines good looks with functionality, strength, adaptability and durability. This table cabinet has a 25mm thick working surface that can be extended to a large working area of 1980mm X 760mm at the comfortable height of 870mm. The table cabinet has the unique "slide out" hooping platform as an integral part of the 4 drawer system. The platform is supported on separate drawer runners for additional strength within the top drawer. This allows hooping to be done at a comfortable height and also offers additional working room when operating the machine. The amount of storage in the three (3) standard (360w x 570d x 65h mm) and one (1) deep drawer (360w x 570d x sides:225h mm) is complemented buy the extra storage available in the open shelving in the unit. The lockable solid heavy duty castors which bolt into the 25mm thick base ensures strength and minimum vibration when the machine is operating. The extendable working surface is readily reduced to 920mm x 760mm when the extension flaps are not in use. The strong castors allow for easy movement and storage when necessary. Use of hardwearing and attractive melamine faced board will give many years of functionality with this attractive piece of furniture. Once the cabinet is assembled it weighs nearly 120kg. This table requires a fair bit of time to assemble. ******Please note the castor change on the table. The castor nuts now can be seen on the bottom panel as per image. Sewing machines and accessories not included. Specifications may change without notice.